Canberra Gallery's Photography + Jewellery Exhibition Asks, What Is Precious? In Our Reality Of Finite Resources 'Greybilly' Asks, What Is Precious? You’re probably wondering: what or who is greybilly?… A bird? A bushman’s kettle? Nope, it’s even more glorious. A greybilly is a grey, green and cream opal, typical to the South Australian mining town of Coober Pedy. It’s also the name of a current exhibition at one Canberra institution that never ceases to surprise us, Nishi Gallery! ‘Greybilly’ by Abigail Varney and Nina Baker is on now at Canberra’s Nishi Gallery. Photo – Rohan Thomson for Molonglo. Melbourne-based photographer Abigail Varney, curator Yasmin Masri, and Sydney-based conceptual jeweller Nina Baker. Photo – Rohan Thomson for Molonglo. Documentary photographer Abigail has a long-held fascination for Coober Pedy. Photo – Rohan Thomson for Molonglo. She has been photographing the opal-mining town’s evolution from 2014 to 2017. Photo – Rohan Thomson for Molonglo. Nina’s contemporary jewellery pieces for this show came about through her internship and Dutch artist and jeweller Ruudt Peters. Photo – Rohan Thomson for Molonglo. Nina has turned leftover and now-functionless plastic containers into beautiful objects. Photo – Rohan Thomson for Molonglo. ‘‘I was considering ideas of waste and the man-made environment,’ explains Nina. Photo – Rohan Thomson for Molonglo. Detail of Nina’s jewellery. Photo – Rohan Thomson for Molonglo. ‘I have been so impressed by the interest in the show, particularly by other jewellers,’ tells Nina. ‘Canberra has a very strong jewellery community, which I knew about, and was inspired by, when I was studying in Wagga Wagga.’ Photo – Rohan Thomson for Molonglo. The exhibition runs until September 29th. Photo – Rohan Thomson for Molonglo. ‘An exhibition about remnants: the traces of mining on the landscape, artificial hills, and the detritus of human life.’ – Yasmin Masri. 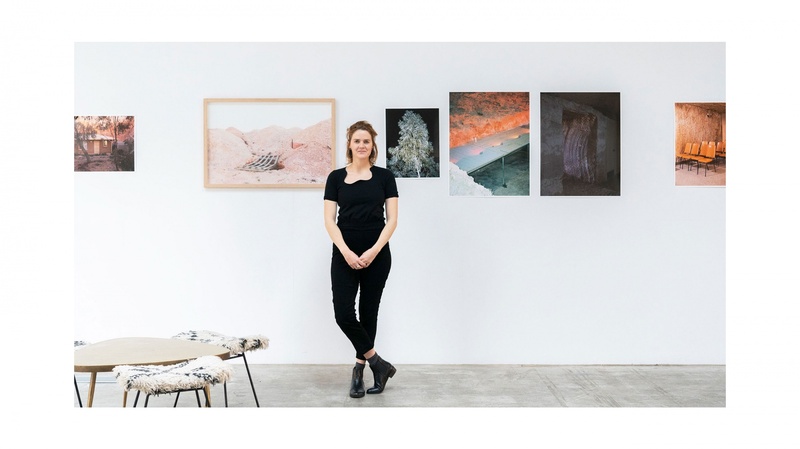 On now at Nishi Gallery, Greybilly explores landscapes and colourscapes through the photographs of Melbourne-based artist Abigail Varney and the conceptual jewellery of Sydney artist Nina Baker. Abigail’s vivid photographs unearth the surreal beauty, unpredictability and depleting resources of once-thriving opal mining Coober Pedy, while Nina’s pieces see disposable plastic containers transformed into opaline objects of beauty. ‘Hopefully, this exhibition asks people to think about how we ascribe value to material. What is precious? What do we leave behind?’ says curator Yasmine Masri, who first heard about Abigail’s project through an artist residency at Hotel Hotel. Yasmin also purchased a opal ring made by Nina after admiring her more experimental works, which initially sparked the idea for this show. Photographer Abigail has a long-held fascination for Coober Pedy, an Outback town where the harsh inhospitable conditions have people residing underground – ‘a landscape that engages imagination and intrigue, shaped and exhausted by its own precious resource,’ she reflects. Visiting from 2014-2017, it was seeing people living off and literally under the land in a town with depleting resources, that inspired her to document the evolution she was observing. This project also provided Abigail, who interned under esteemed photographer Mary Ellen Mark in New York City, with the opportunity to expand her photographic practice from portraiture to documentary and landscape work. She has since picked up a landscape award from the Centre for Contemporary Photography, Melbourne, for this project. Artist Nina has a bachelor of jewellery from CSU in Wagga Wagga, and is currently undertaking a Masters of Curating and Cultural Leadership at UNSW. Her works for this exhibition came about through an internship in Amsterdam, with the Dutch artist and jeweller Ruudt Peters. ‘I was considering ideas of waste and the man-made environment. I focused on plastic containers, the kind used to package vegetables, meat and cheese, which in the Netherlands are called ‘bakjes’. My process of thinking-through-making led me to cast and carve from these,’ details Nina. 'Strange' new ceramics from the experimental Melbourne maker. A studio visit with the fascinating artist/writer/curator/gardener ahead of his 'Imayimightimust’ exhibition opening this week.